Maria's Mélange: Slice of School Joy and MATH! Slice of School Joy and MATH! One of the many joys in my day is teaching a variety of subject areas. Being unable to choose between my love of reading, math, writing, history, science... (well... all of it) was the biggest deciding factor that pushed me into elementary education. I can honestly relate to students who are fascinated by almost anything! I have great curricular materials for teaching math. Some I've been given by my district and some I've acquired over the years. This gives me the chance to mix and match cool problems into any specific content that I'm teaching to meet the state standards. Even so, frequently I get a bit bored and need to find something to spice things up. Last week, I was working some with a cool problem solving site called "Would You Rather?" Instead of helping the kids along, giving them any missing information as part of the problem, this site tries to post more real world, open ended problems. Perfect. Instead, I asked THEM what questions they had - and how they would try to find out that information. Quickly intrigued, their hands shot up with questions about the weight of an average banana. They weren't satisfied with the idea of just weighing ONE, either. Excellent! 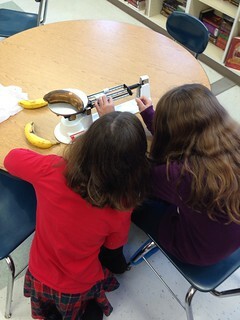 The next day, enough students brought in bananas that we had nine to weigh. We worked on decimals (since the triple beam balance was in grams), measurement, how to find an average, measurement error, and teamwork. That's a pretty darned good haul for a day! If you want to try problems like this for older students, Dan Meyer is the man. Some of his problems work for my elementary kids, but some are still above their heads, which is why I was psyched to find this "Would you rather" site. Just now, when visiting the site to write this post, I discovered the most recent one is a probability question. That will be perfect for my fifth graders! http://wyrmath.wordpress.com/ -- "Would You Rather"